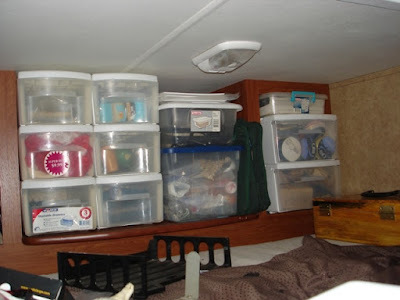 The bedroom loft in our Road Warrior was a hodge-podge storage area, we don't have people sleeping over, so I just stacked totes from the head to the foot of the bed. This wasn't working out very well, so I was pleased to find that transparent storage drawers fit perfectly in the headboard storage are, (where there are normally cupboards and a TV). I then went on to put more drawer units down the far wall. I managed to get everything I used for sewing/ beading in those drawers and now if my Sister comes to visit, there's still room for her to sleep, and I have room to move around when I'm looking for something! The ones I actually used came from KMart and are only sold by them, as far as I know. The ones shown in the Amazon ad above are close, but not quite what I used. I suggest taking your measurements and going to KMart. The set of three drawers come banded together, but can be un-banded and stacked differently.